Terrance is a role model of strength, leadership, and perseverance. He began volunteering in a hospital at the age of 14, loved working in healthcare, and decided to make healthcare his life’s work. With the death of his mother when he was a senior in high school, Terrance became responsible for his family of 11 brothers and 4 sisters. He successfully graduated high school and went to work in the healthcare industry. For the last five years, Terrance has worked as a Mental Health Worker at Episcopal Hospital. He knew he wanted to pursue a degree and was inspired by the large number of Episcopal workers taking classes through the Training Fund. 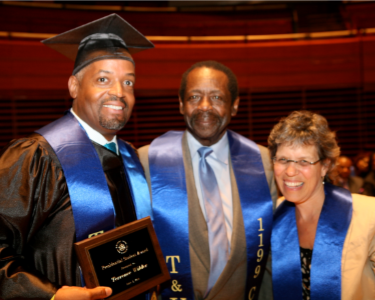 In 2012, he was awarded a full time scholarship from the Training Fund to attend Delaware County Community College for Healthcare Management. Terrance experienced a great tragedy during college with the death of his oldest son from a car accident. Despite this horrendous loss, Terrance graduated on time and is pursuing a Bachelor’s degree in Healthcare Administration at Drexel University. 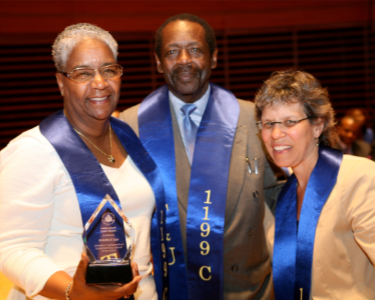 In the early 1980s, Gail worked as an Electroencephalographic Technologist at Metropolitan Hospital and participated in the Training Fund's first Associate Degree Program in Biomedical Engineering through Temple University. Gail was the only woman to participate in the first class, helping to break the gender barrier in the hospital engineering departments. Gail quickly became "one of the guys" while giving them motherly support – almost the entire class graduated and went on to work and eventually lead several hospital engineering departments, as well as Bell Laboratories. Gail was hired by HUP following receipt of her degree and moved up the ranks to supervisor, providing oversight to the biomedical department for over three decades and pioneering the role of women in engineering. All through these years, Gail has never forgotten District 1199C and the Training Fund, making herself available to tutor math, to mentor others, and to help plan a future 40th anniversary Training Fund celebration. 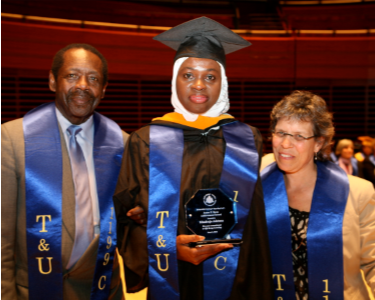 Jewel applied for the Scholarship Program as a Mental Health Worker at North Philadelphia Health System, and was granted full time funding to attend LaSalle University’s Achieve Nursing Program in 2012. We are proud of Jewel’s accomplishment in graduating from LaSalle with her Bachelor’s in Nursing, passing the state boards on the first attempt, and now pursuing employment as a BSN. She has been offered employment in a psychiatric nursing position that will raise her former mental health wage of $18/hour to $30/hour; she is also considering a nursing position in a teaching hospital on a neurology floor. Khadijah has worked as a Residential Aide at TAIG (The Association of Independent Growth), which is part of Northwestern Human Services, since 2010 when she also began the Registered Nursing Program at Immaculata School of Nursing. 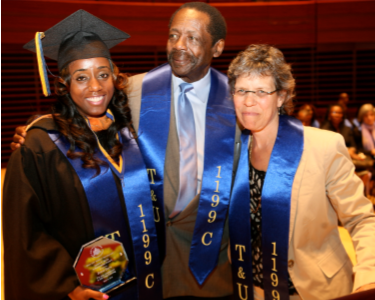 She used the Training Fund’s Tuition Reimbursement Program for three semesters until she received the Full Time James T. Ryan Scholarship in 2012. She has overcome many challenging obstacles to achieve her Bachelor’s Degree in Nursing as a single mother of three beautiful girls, ages 6, 10 and 12. She is greatly appreciative of the financial support from the Training Fund, without which she would not have been able to attain her goal of completing the BSN Program.